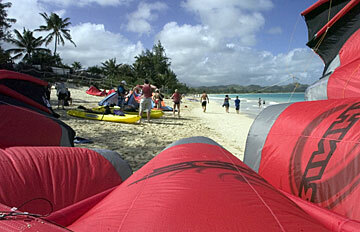 The Kailua Road entry point to Kailua Beach Park is also the launch area for kayakers, wind and kitesurfers. Recreational users say that occasional conflicts stem mostly from visitors unfamiliar with park rules. It was both sunny and windy at Kailua Beach Park yesterday -- good weather for kitesurfing, windsurfing, kayaking or hanging out at the beach. But some Kailua residents think there's too much activity at the beach, and are asking the Kailua Neighborhood Board to curb kitesurfing, which with its giant inflated kites and 100-foot-long strings take up the most room on the beach. Others say that the mix of ocean users is a friendly one that works. Dangerous behavior by kitesurfers or windsurfers -- including surfing in swimming areas or in the shore break -- can be reported to the Department of Land and Natural Resources conservation officers by calling 587-0077. Dan White, a tour guide for Kailua Sailboards and Kayaks, said he hasn't seen any confrontations among beach users in the year he's had the part-time job. His customer Jeanie Albin said the mix at Kailua Beach didn't look nearly as intense as the hordes of windsurfers on the Columbia River near her Portland, Ore., home. Longtime Kailua resident Sandy Bell, walking her poodle on the beach yesterday, said that although she's glad people are having fun, it does seem like kitesurfers are everywhere and she has to tip-toe through "a maze" of strings. Twenty years ago it was Hobie cat sailboats. Ten years ago it was windsurfers. And now it's kitesurfers' turn to be under public scrutiny as the "new kids on the block," said Arlene Cabacungan, a kitesurfer and co-owner of Hawaiian Watersports. Cabacungan said she thinks too many people are kitesurfing or support kitesurfers to ban it in Kailua. On Thursday the Kailua Neighborhood Board will consider a proposal to ask the state Department of Land and Natural Resources to license kiteboarders and use funds from the license to increase Kailua Bay enforcement patrols. The meeting starts at 7 p.m. at the Kailua Recreation Center. The Oahu Kite Club, with 175 kiteboarding members, opposes licensing all kiteboarders. The club proposes licensing just kitesurfing instructors, to ensure that all have lifeguard, first-aid and instruction technique training. It also wants better signs with a map that shows the 300-foot-wide beach area designated for windsurfers and kiteboarders -- and consideration of making the area bigger. In the past few months, in response to concerns, members have stepped up their "self-policing" -- reminding fellow kite surfers that they need to watch out for other beach users and not pull flips and tricks within 200 feet of the shore, member Anne Gasc said yesterday. Kailua Bay is the safest place to kitesurf in Hawaii, because the prevailing winds blow toward shore and there is little coral, kitesurfers said. For the most part, people at Kailua Beach yesterday said the different groups do get along and treat each other with common courtesy. "Some people are stubborn. They say, 'Who are you to tell me what to do,'" Gasc said. "If we had a sign, then we could show them that's the area" where windsurfers have priority. 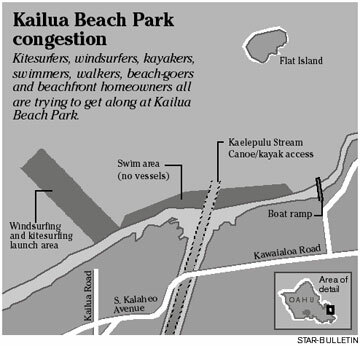 "I think most kayakers, kiteboarders, windsurfers and residents love the ocean and want to have an active ocean in Kailua," Gasc said. Yesterday between 9 a.m. and 1 p.m. the coming and going of kitesurfers, windsurfers and kayakers was steady. Courtesy and common sense seemed to rule, with kiteboarders not launching until walkers passed or kayakers got out of the way. Every few minutes tourists would pull bright yellow rented kayaks down Kailua Road on wheeled carts, slather on sunscreen and paddle off. The grassy area next to the parking lot had a half-dozen brightly colored giant, crescent-moon-shaped kites laid out, with owners preparing them for action. When ready to launch, they moved, usually one by one, to the beach to wait for a moment when no beach walkers, kayakers or windsurfers were in their way. That's when a friend, usually a fellow kitesurfer, helped hoist the kite aloft. The kitesurfer gets in the water and zooms away. The Star-Bulletin did see one apparent close call yesterday, when a kitesurfer got a little impatient waiting for a man and woman with a dog to get their rented kayak off the beach and into the water. 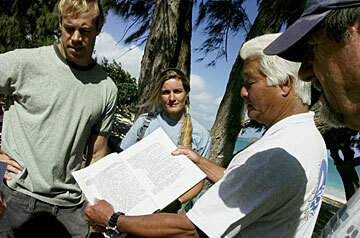 Harbor Master Earl Omoto reviewed the Department of Land and Natural Resources Administration Rules pertaining to public beaches at Kailua Beach Park yesterday morning. Omoto met with Erik Eck and Anne Gasc of the Oahu Kitesurfers Club and Mike Dudley of the Kailua Neighborhood Board to discuss possible solutions. Deciding to go ahead of them, the kitesurfer signaled the man holding his kite to release it. For a fleeting moment, the strings to his kite passed as close as a yard over the head of the woman with the kayak. Within seconds the kite was up, and the kitesurfer in the water speeding off. The woman, Emma Brooks, said before she and husband Drew Tipson got the kayak in the water that the incident didn't alarm her. "It's a congested spot," said Kevin Robb, a Schofield Army soldier who has been kitesurfing about eight months. "But I've never seen a major issue." Gasc said she's not aware of any bystander being injured by a kiteboarding incident. Stephanie Duval and Isabelle Prevost, tourists from Montreal, were sunbathing on Kailua Beach yesterday within a few feet of where kitesurfers were coming and going. They said they didn't realize the area was designated for wind sports. Provost admitted that she was "a little bit" scared that a kitesurfer was going to "land on top of me," but not enough to move. Millie and Bert Rice of Kailua were nearby in beach chairs, and their three grade-school-age children were playing in the sand. "Everybody is coexisting, from what I can see," Millie Rice said of the mix of beach users. "When we were walking up here with our children, they (the kitesurfers) were very good about stopping what they were doing and letting us go under the lines."